We have a slightly shorter growing season here in Minnesota because of our long winters and cold springs. We only start growing vegetables and herbs around mid May. As I knew we will be away in June, it was pointless to grow anything then as they would not have survived the 3 weeks without some tender loving care. So, no homegrown vegetables or herbs this year as it is a little late to try and start growing anything now. 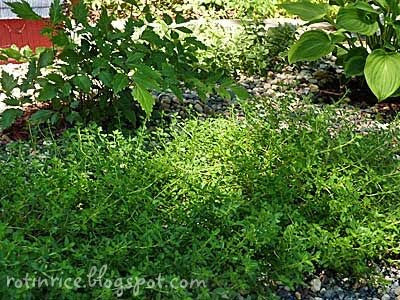 The only exception is thyme, as these hard-working herbs planted last year came back…woohoo! These guys are really hardy and survived the harsh winter! The boys have been requesting for pasta ever since our return. They enjoyed some of the most delicious Asian foods out there but now they are hungry for some good ol’ home-cooked local fare. I had to oblige. After 30 minutes of cooking, there were two happy campers and one amazed but happy mom! They polished their plates in 10 minutes flat and would have gone for seconds if there was more. Aaaahh…the joy of cooking for teenagers with healthy appetites! Cook pasta as per packaging instructions. Drain and set aside. Butterfly chicken breast. Sprinkle with salt and pepper and ½ teaspoon dried thyme on both sides. Add 1 tablespoon olive oil to a non-stick pan and pan fry chicken breast for 2 to 3 minutes on each side. Remove and slice. In the same pan, add remaining 3 tablespoons olive oil. Sauté garlic for one minute. Add shrimp and cook for about 2 minutes. Shrimps should curl and turn pink. Add ½ teaspoon dried thyme, red pepper flakes, and grape tomatoes. Cook for another minute. Return pasta to the pan. Season with salt and freshly ground pepper. Stir to mix ingredients thoroughly. Add fresh thyme and lemon juice. Stir, turn off heat, and remove. Serve pasta topped with sliced chicken and parmesan cheese. And now for the award….. I want to thank these three (or rather 5) wonderful bloggers for sharing this award with me. 1. Julie at Mommie Cooks!. Julie’s blog is always so fun to read and I enjoy her food adventures with her three adorable boys. 2. The team of three – Magic of Spice, Truffle Shuffle, and Sugar and Spice at The Ardent Epicure. Their blog is relatively new to me but they have some fabulous recipes there. 3. Jillyann at The Homegrown Gourmet. Jillyann’s blog is full of very creative recipes with interesting stories on the origins and inspiration for that recipe. I hope you will visit them soon. Enjoy…..and have a wonderful day! Congratulations on your award and love your lemony pasta dish that's just right for summer nights! Best from Jefferson's Table. Congratulations on your award Biren! You're definitely more than deserving of it. That's a beautiful pasta dish. Your boys are lucky to have a a mom who knows her way around the kitchen as well as you. I would've gobbled that down in record time too :-P. Have a lovely weekend. Hi Biren ! how are you ? Just got back rom India.. Lemon & thyme pasta looks amazing. One of my favorite ingredient combinations. Thyme & lemon is magic. So is lemon thyme actually. Congrats!! This pasta dish looks wonderful! Congratulations on your award and the pasta looks definitely good with thyme and lemon. Congratulations on the well deserved award and the pasta looks so good. I may have to throw some pasta at my bunch tonight. My step-sons leave tomorrow and they have eaten everything that wasn't nailed down since arriving. Maybe I can make enough pasta to fill them up?? I really like that pasta dish! 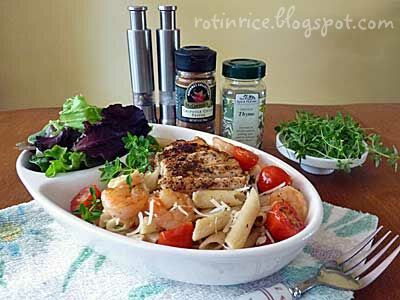 Thyme and lemon pasta looks really good. I can see why the family gobbled it up so quickly. I love reading your posts with lovely food cooked at home and the award was well deserved. Hi Stella! I used the De Boles rice penne. I took a closer look at it and found that it is actually made of rice flour and rice bran. It's all natural, no preservatives or chemicals added. I don't know why but I always thought it was made of brown rice. I do use brown rice elbows purchased at the bulk section of the health food store I go to. I can't remember if the bulk penne is made of brown rice. I'll check and let you know. Congratulations on your well deserved award! Wonderful ingredients in your pasta dish, looks like a delicious family meal. The paste looks delicious. And congratulations on your award. Congrats on your award! I'm ashamed that I have not yet written my award post. 🙁 Glad your boys are back. The pasta looks fresh and hearty. Yummy! Thanks for the shout out Biren! 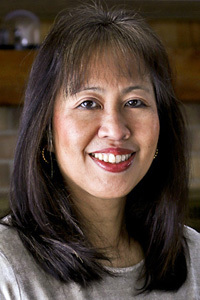 You absolutely deserve the award; I love your blog! And this pasta dish, YUM! Your beautiful picture makes me want to grab a bite straight from the screen. Have a wonderful weekend! Congrats on the award Biren – definitely well deserved! Love the pasta recipe! Lemon and thyme together sound wonderful and I am so envious that you have the space to grow things *sigh* I can only dream! Congratulations on the award. Love the light flavors in this pasta. Oh Biren, your thyme looks glorious, rosemary is also a very woody herb that survive the cold .I had some planted when I was living in NY. Your pasta looks delicious. Congrats on the award. What a delicious and comforting pasta dish! Packed with lovely flavors. Pasta makes me happy too! Congrats on your well deserved award! That's another gorgeous pasta dish. Thanks so much for sharing it with us. My thyme will be put to good use. Congratulations! The pasta looks delightful! 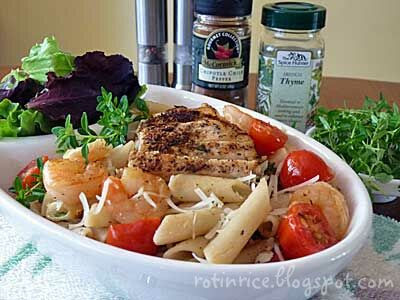 …what an outstanding pasta dish, Biren…love the addition of fresh thyme…makes a world of difference! !